The Human Age is Ending! Violent quakes split the world asunder, and nature itself is seemingly intent on destroying the civilisations of humanity. Deep in the heart of Africa, something is stirring. This expansion introduces Shudde M'ell, a destructive new Ancient One. Heralding this new threat is the advent of Disasters and Devastation Encounters as well as new Mythos cards. Four weary investigators join the fight, bringing with them new Artifacts, Assets, Spells, and Talents to stave off the twilight of humankind. 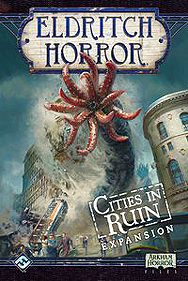 Eldritch Horror Required for play.